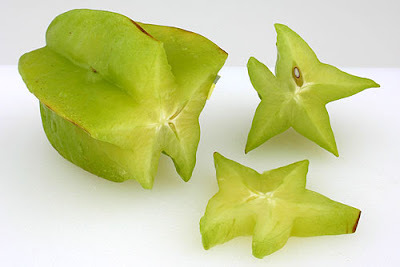 Starfruit (Averrhoa carambola) is a popular tropical fruit in numerous countries of Asia and South America, and is increasing found in Western countries as well. Why am I writing about this on the Renal Fellow Network? It turns out that the starfruit contains an as-yet unidentified substance which is renally cleared which may act as a neurotoxin in individuals with severely reduced renal clearance. There are numerous case series (Neto et al, Nephrol Dial Transplant 2003, 18(1):120-125) which describe ESRD or advanced CKD patients which, after ingesting as little as one starfruit, went on to develop neurologic symptoms ranging from hiccups to seizures to coma to even death. Injection of purified starfruit toxin into uremic rat brain can also induce neurologic problems. 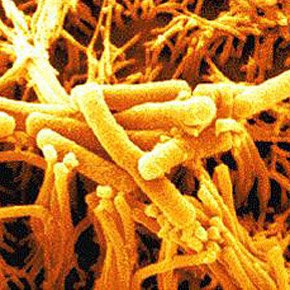 Interestingly, the toxin appears to be dialyzable, as altered mental status can be rapidly improved with dialysis. In addition to this unidentified neurotoxin which can cause major neurologic problems, starfruit contains another renally-relevant substance: it is rich in oxalate. In patients with CKD, oxalate crystal deposition may accelerate renal deterioration. Here are a few random pearls that I took away from yesterday's combined Beth Israel-Brigham-Mass General renal fellows' educational talk by Burton Rose a.k.a. 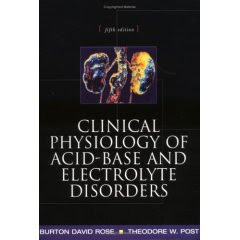 "The Up-To-Date Guy" and author of the highly-recommended "Clinical Physiology of Acid-Base and Electrolyte Disorders". 1. The individuals who are the most susceptible to osmotic demyelination with overcorrection of hyponatremia are, for reasons which are as-yet unclear, young pre-menopausal women. 2. Hypernatremia is almost always caused by a defective thirst mechanism. Hyponatremia is almost always caused by an elevated ADH. 3. There are cases of osmotic demyelination which have been reported with only normal saline repletion of hypovolemic hyponatremia. In hypovolemic hyponatremia, a significant decrease in intravascular volume stimulates secretion of ADH; once a patient is euvolemic the ADH secretion should stop abruptly and the patient may experience an abrupt water diuresis. If the sodium is increasing too rapidly, one school of thought is that DDAVP should be given to limit the rate of sodium rise. 4. 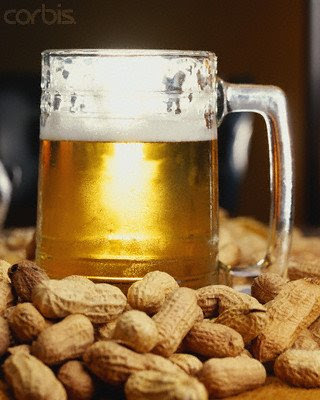 The reason that pretzels and peanuts are served at bars is to raise your sodium concentration enough to stimulate the thirst mechanism for you to want to order a tasty adult beverage. I would highly recommend the following book for renal fellows everywhere: "Dropsy, Dialysis, Transplant: A Short History of Failing Kidneys", by Steven Peitzman. I am presently reading it during my trips on the "T" while commuting into Mass General Hospital in the wee hours of the morn. What is "dropsy"? 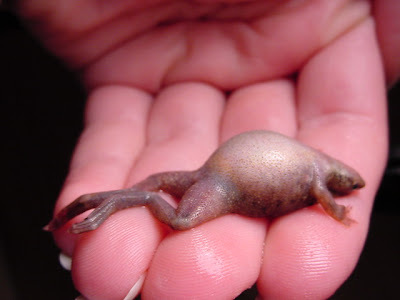 Dropsy--still used to describe ailments which affect marine animals such as fish or frogs (see left)--was the ancient word for edema, or total body sodium excess. Like the word "edema", dropsy does not make any distinctions between its many causes: heart failure, cirrhosis, kidney disease, etc. But the British physician Richard Bright (1789-1858) in his landmark autopsy studies noted that a particular subset of patients with dropsy had a characteristic type of scarring of the kidney which was also associated with the appearance of albumin in the urine, which he could detect by placing a flame under a urine specimen. We now know this as "nephrotic syndrome", even though "Bright's Disease" is considered by many as the first "named disease" which was named after its discoverer. Here's a case I saw on the consult service last week which demonstrates the utility of examining the urine sediment yourself. The clinical scenario: a 50 year-old male with a history of hepatitis C liver disease who was admitted with altered mental status and a rising bilirubin. About a week into his hospital stay, his creatinine began rising from its baseline of about 0.8 to as high as 3.5 mg/dL. His T-bili had made it up to 18 and he was being evaluated for a liver transplant. He had received some iv contrast a day before his creatinine started rising, and before we examined the urine sediment I was pretty certain the diagnosis was going to be either hepatorenal syndrome or contrast-induced nephropathy. 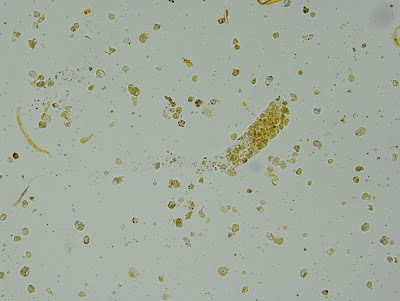 Interestingly, his urine showed the following (this is a photo of the actual sediment): WBC casts! The WBC casts were not difficult to find and there were plenty of WBCs present in a non-Foleyed specimen. It turns out that the patient had had a single blood culture which was positive for MSSA and was being treated with iv nafcillin. The diagnosis here is acute interstitial nephritis (AIN), and we are recommending a short course of oral steroids (though I realize that this is certainly a controversial topic). The hospital's automated urinalysis--which over the course of this year I have learned to not put much faith in outside of the dipstick analysis--did not make note of any casts, and is a clear example that a nephrologist's evaluation of the urine sediment still is an essential part of the consult evaluation. Any nephrology fellow running the Consult Service will rapidly realize that heart failure and renal failure often go hand in hand, earning the moniker "cardiorenal syndrome." The thought here is that decreased forward flow from pump failure results in renal hypoperfusion and a resultant decrease in the GFR. The most joyous moments in the treatment of cardiorenal syndrome--and unfortunately this does not happen as often as we would like--are when a patient's creatinine starts decreasing WHILE the patient is getting diuresed. How to explain this phenomenon of decreasing Cr with diuresis? One potential explanation would be that the patient is being brought onto a more favorable portion of the Frank-Starling curve (above) by fluid removal, thereby allowing increased cardiac output and increased renal perfusion. However, according to many cardiologists (and according to the figure above), the Starling curve actually plateaus--there is no "downswing" with very high filling pressures. An alternative explanation for decreasing Cr during diuresis is that the high CVP during severe CHF results in a back-transduction of pressure through the glomerulus, thereby decreasing GFR. Reducing the CVP (e.g. with diuresis) would then result in an improved GFR. ANCA-positive vasculitides are a not uncommon cause of rapidly progressive glomerulonephritis. When we send off an ANCA test, what are we actually measuring? ANCAs (anti-neutrophil cytoplasmic antibodies) are a type of IgG autoantibodies that are directed against antigens found within neutrophils. The test was developed by ethanol-fixing neutrophils and then adding patient serum to the cells. 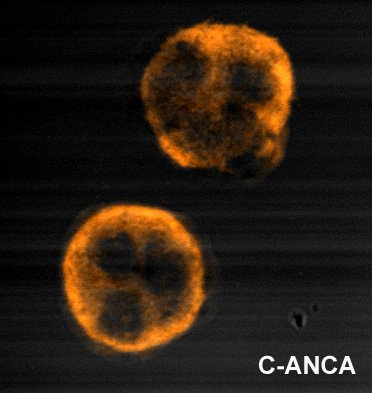 A secondary antibody with an immunofluorescent tag can be used detect the presence of ANCA, which can take one of two primary patterns: c-ANCA (demonstrating cytoplasmic staining) and p-ANCA (demonstrating peri-nuclear staining). It is important to note that these patterns are largely artifactual in the sense that the antigens detected by p-ANCA are also cytoplasmic, but with EtOH fixation the protein precipitates in the perinuclear pattern noted in the figures shown. 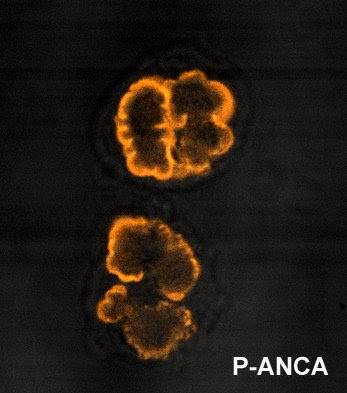 p-ANCA antibodies are usually directed against the antigen myeloperoxidase (MPO) although in some instances may be directed instead against lactoferrin, elastase, or cathepsin G, while c-ANCA antibodies are usually directly against the antigen PR3 (proteinase 3). The most convincing evidence that ANCA antibodies play a pathogenic role in the development of disease is the finding that murine MPO knockout mice, when immunized with murine MPO, can generate anti-MPO antibodies which are able to induce a necrotizing, crescentic glomerulonephritis when injected into Rag2 knockout mice (which lack functioning T & B lymphocytes). The case: a 50-ish yo woman, normal baseline renal function, and a history of nephrolithiasis x 2 episodes presented with gross, painless hematuria. She was initially thought to have another stone event, but she had no significant flank pain. 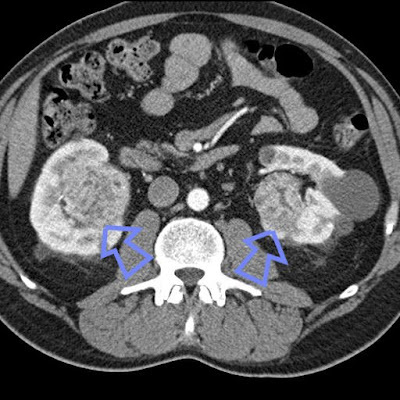 Ultimately she underwent CT imaging which revealed bilateral renal masses suspicious for renal cell carcinoma. Fortunately, there was no evidence of metastatic disease, and she underwent a R total nephrectomy followed by a partial L nephrectomy, leaving her with about 1/4 of her original nephron mass. Pathology reveals a clear cell-type RCC in both biopsy specimens. Her Cr remains in the 1.0-1.2 range. A question is raised as to why she developed two separate RCC's. There is an interesting differential diagnosis of bilateral RCCs which includes some interesting genetic syndromes, the most common of which is von Hippel Lindau Syndrome, an autosomal dominant inherited gene caused by mutations in the VHL gene. Because the VHL gene is a tumor suppressor gene, there are other tumors which may occur in these patients, including pheochromocytomas and hemangioblastomas, among others. Specifically it is the clear cell RCC which occurs in VHL Syndrome. Other genetic disorders causing RCC's include Hereditary Papillary RCC (caused by mutations in the c-met gene), Tuberous Sclerosis (more likely to cause benign angiomyolipomas, but can result in RCCs), Hereditary Leiomyoma and Renal Cell Cancer Syndrome, and the Birt-Hogg-Dube (BHD) syndrome (resulting in chromophobe RCCs). Despite these numerous possibilities of mutations causing RCC, a 1998 study revealed that amongst patients with bilateral RCC who underwent extensive mutation screening, only 12% had a hereditary form of RCC whereas the remaining 88% had "sporadic", bilateral RCCs. One of the rare but potentially severe complications seen with hemodialysis is intravascular hemolysis. There is an interesting differential diagnosis of what might cause dialysis-associated hemolysis, many of which have to do with contamination of the dialysis water supply, and therefore one may observe this as an outbreak of hemolysis clustered within the same dialysis unit. Hopefully, the incidence of these outbreaks should be relatively low with proper water monitoring. -"The 3 C's": water contamination with COPPER, CHLORINE, or CHLORAMINE can all cause hemolysis-with-dialysis. -Other contaminants, such as nitrite, nitrates, or formaldehyde may also cause hemolysis-with-dialysis. -Overheated Dialysate can cause it. -Kinked tubing: also different batches of defective tubing have also been cited as a cause of hemolysis at dialysis. -Hypotonicity: e.g. if there is an error mixing the concentrate with not enough water. If there is any suspicion of hemolysis(which might be detected based on a falling Crit line, severe pain, or pink-hued filtrate), the blood lines should be immediately clamped and not returned to the patient, as there is a high risk of hyperkalemia in this setting. I saw my 2nd case this year of renal effects of Ovarian Hyperstimulation Syndrome (OHSS). 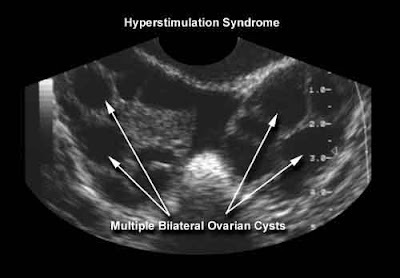 OHSS is a complication of in vitro fertilization therapy, in which pharmacologic doses of gonadotropin therapy can lead to enlarged ovaries filled with multiple cysts, the result of multiple follicles maturing simultaneously. The follicles release multiple growth factors (e.g. VEGF) which increase capillary permeability, often resulting in massive ascites, weight gain, and volume overload. In both cases I have been consulted on, the patients have had significant intravascular volume depletion and hypovolemic hyponatremia as a result of significant 3rd-spacing. Welcome to Cytoxan (cyclophosphamide), one of the most versatile (albeit toxic) medications in the nephrology world. Its mechanism of action is as an alkylating agent; it induced alkylation of DNA in actively proliferating cells, which explains its use as a chemotherapeutic as well as an immunomodulatory agent. Its use in renal disease includes lupus nephritis, nephrotic syndrome of several types, ANCA-associated vasculitides, and many others. 1. Hemorrhagic Cystitis: one of the metabolites of Cytoxan, acrolein, causes bladder irritation and can result in hemorrhagic. The risk of this complication can be limited by the concomitant use of mesa, which accumulates in the collecting system and binds/inactivates acrolein. 2. Infertility: this can occur in both men & women; men are encouraged to do sperm-banking before receiving Cytoxan while women may be offered Lupron therapy in an attempt to chemically suppress the ovulatory cycle for the time they are on the medication. 3. Alopecia: like many of the side effects associated with Cytoxan, this one is rare at the doses given for renal disease, which are typically much smaller than those given for oncologic disease. 4. Increased Risk of Infection/Leukopenia. 6. Increased risk of Malignancies in the future: especially bladder cancer. 7. SIADH: rare but possible. Trick Question: Which would you imagine to be lower osmolarity between "low osmolar iv contrast" and "iso-osmolar iv contrast"? The answer is, for historical reasons, "iso-osmolar contrast." 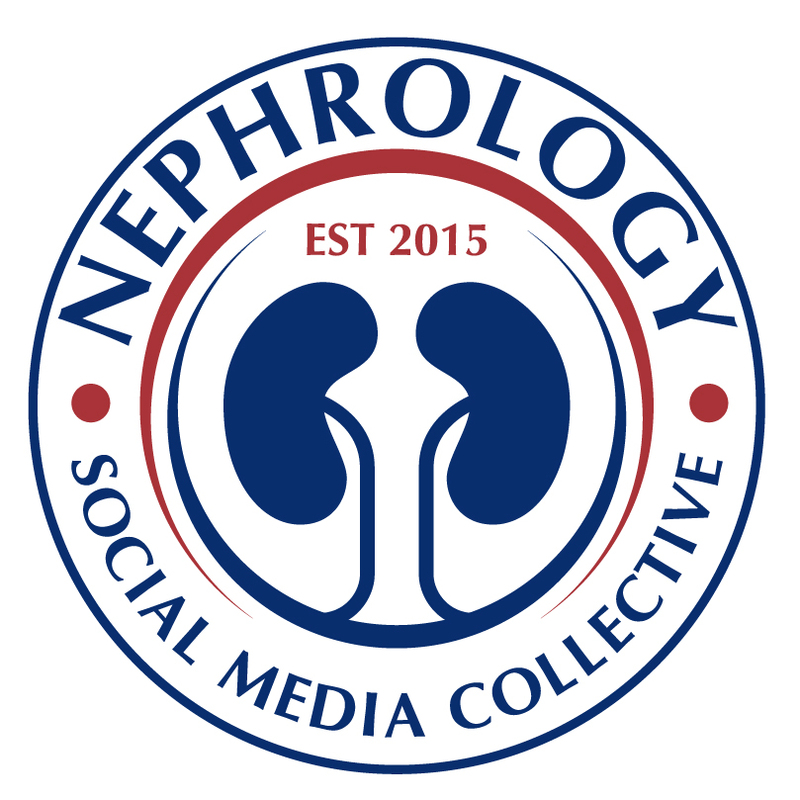 The increasing use of iv contrast agents led to the identification of contrast-induced nephropathy (CIN) as a major cause of in-hospital acute kidney injury. CIN is characterized by an increase in Cr beginning 24-48 hours following dye exposure followed by resolution (in most but not all cases) within the following 3-5 days. It has become apparent that the osmolarity of the iv contrast solution plays a major role in the nephrotoxicity of iv contrast: initial preparations were highly hyperosmolar (1400-1800 mosm/kg) and caused CIN commonly; the "2nd generation" iv contrast compounds were called "low osmolar iv contrast" based on the fact that their osmolarity was substantially lower (500-850 mosm/kg) than that of 1st generation compounds but nonetheless still hyperosmolar when compared with human serum. 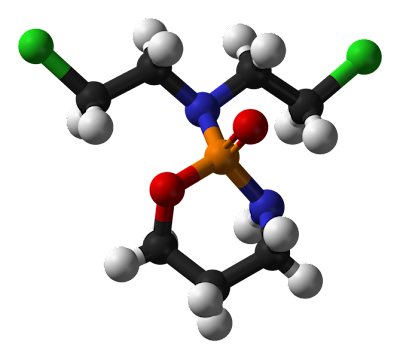 Currently it is felt that "iso-osmolar iv contrast" agents (e.g., iodixanol--molecular structure below) have the lower risk of CIN. Post-transplant lymphoproliferative disorder (PTLD) occurs in < 1% of kidney transplant recipients, but can often be a serious complication. In essence, PTLD is a form of lymphoma which occurs due to decreased immune surveillance as a result of the immunosuppression used to prevent allograft rejection. 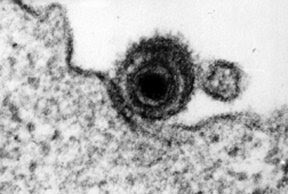 The pathophysiology of PTLD is intimately linked to the Epstein-Barr virus (EBV--pictured on the left attaching to a host cell), a member of the gamma herpesvirus family. It attaches to B-cells and in the absence of immune surveillance may result in hyperproliferation of B-cells leading to a lymphoma. Most often the disease is a systemic one with extensive lymphadenopathy and involvement in multiple solid organs. However there are variants of the disease in which the sole manifestation is within the transplanted kidney itself. The infected cells are almost always from the recipient as opposed to being from the donor. PTLD is best treated by withdrawing immunosuppresion--often by completely removing CNI inhibitors & MMF while continuing low-dose prednisone. In addition, rituxamab (a monoclonal antibody against CD20, a B-cell antigen) has been noted to have a positive effect (which makes sense since this is almost always a B-cell lymphoma). Chemotherapy such as the CHOP regimen are reserved for patients with PTLD with more worrisome lymphoma-type features. An interesting scenario of "acquired" anti-GBM disease can occur when a patient with Alport's Syndrome gets a renal transplant. 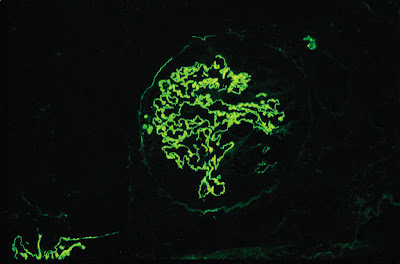 Patients with Alport's Syndrome--a cause of hematuria with progressive renal failure and hearing loss--have mutations in genes encoding certain subunits of the collagen IV molecule which comprises a major structural component of the glomerular basement membrane. 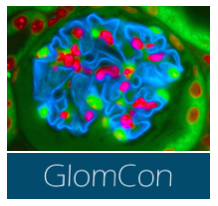 When they undergo a renal transplant, their immune system may well recognize the donor collagen IV as "foreign" since it has never been exposed to this antigen previously, and this can lead to the formation of circulating anti-glomerular basement membrane antibodies and subsequent allograft dysfunction. 1. Citrate Toxicity. For patients in whom a citrate-based replacement solution is used, citrate toxicity may develop in patients with liver disease who lack the ability to convert citrate to bicarbonate. As a result, citrate accumulates and results in a worsening anion gap metabolic acidosis. The increasing citrate levels bind ionized calcium (reducing the iCa level), and the acidosis causes a dissociation of calcium and citrate in vitro, resulting in a rising total Ca level. Patients with citrate toxicity must be converted to a bicarbonate-based replacement solution ASAP. 2. Refractory Acidosis. Occasionally patients who are very hemodynamically stable will remain acidotic even while on CVVH. One solution to this dilemma is to increase the replacement solution rate. For example, at a standard RS rate of 1600 cc/hr, this is delivering a HCO3 concentration of 64meq/hour; increasing the RS rate to 2400 cc/hr will therefore increase the HCO3 delivery rate to 96meq/hour. Another strategy is to add an isotonic NaHCO3 drip: at 250 cc/hour, this results in an additional 37.5 meq/hour, and the additional volume can be handled by ultrafiltration. 3. Electrolytes: Phosphorus and Potassium often need repletion due to the continual nature of CVVH. 4. Recurrent System Clotting: The bane of the Nephrology Fellow is recurrent system clotting, as it may lead to repeated late-night phone calls and unplanned dialysis catheter placements. There are several maneuvers one can perform to limit clotting, though none has a 100% success rate. These include changing to a citrate-based replacement solution, using systemic anticoagulation (e.g., heparin or Argatroban) if it is not contraindicated, increasing the blood flow rate, increasing the replacement solution rate, or performing a heparin prime & dump before beginning. If all else fails, a new dialysis catheter (preferably something with a wide lumen, such as a Niagra catheter) may be warranted. We all realize that maintaining vascular access is a dialysis patient's life-line. Many patients must undergo multiple interventional radiology or surgical procedures in order to sustain fistula or graft patency over a prolonged period of time. The physical exam can be a useful tool in the examination of vascular access. Stenoses--often the culprit for a malfunctioning fistula or graft--can be characterized as either inflow or outflow stenoses, with outflow stenoses being the most common. Both may occur in the same access. Inflow stenosis--the definition for which is debatable but one reasonable one is a narrowing of >50% when compared to the native artery--can be detected by an abnormal pulse augmentation exam. In a normal fistula, occlusion of the access several centimeters beyond the arterial anastamosis should lead to a detectable increase in the magnitude of the distal fistula pulse. When there is substantial inflow narrowing, no such increase will be observed. In addition, a weak pulse or lack of continuous thrill may also be indications of inflow stenosis. Outflow stenosis can best be detected by an abnormal arm elevation test. In a normal fistula or graft, having the patient raise their arm should allow venous collapse and flattening of the fistula; if there is significant outflow stenosis the fistula may remain plump with arm elevation. In addition, a water-hammer pulse, a loud systolic thrill, or prolonged post-dialysis bleeding may also be signs of outflow stenosis. A relatively recent study (Asif et al, CJASN 2007) confirmed that a good physical exam correlates well with angiographic data. What is the Resistive Index? Often on the official radiology report for a renal ultrasound with Doppler flows, a number called the "resistive index" is listed. What does this number mean and how is it derived? The resistive index (RI) measures the resistance of renal arterial flow to the kidney. In a normal situation, flow through the renal artery occurs throughout systole and diastole. However during a variety of conditions--transplant rejection, inflammation, obstruction--there will be reduced to possibly even reversed flow through the renal artery during diastole. When this happens, the resistive index--which is calculated by measuring the arterial waveform throughout the cardiac cycle as described in the figure--is elevated. An RI <0.8>0.9 is considered elevated. The differential diagnosis for an elevated RI should include transplant rejection, obstruction, ATN, pyelonephritis, severe hypotension, or an acute vascular event (e.g. renal vein thrombosis). The two most common organisms causing PD-related peritonitis are (1) Staph aureus and (2) Pseudomonas. Certainly there are other causes--for instance fungal peritonitis (one of the indications for immediate catheter removal) and coagulase-negative Staph species (which usually responds rapidly to antibiotic therapy). As such with suspected peritonitis, before culture results come back, both gram-positive and gram-negative coverage is essential. At our institution (and those with a high rate of MRSA--an ever-increasing problem) the typical cocktail is to give vancomycin plus something for gram-negative coverage--either gentamicin (it's okay and doesn't lead to a significant loss of residual renal function if given as a short course) or ceftazidime typically. In terms of prophylaxis, an interesting randomized controlled trial (Bernardini et al, JASN 2005) comparing topical gentamicin cream versus mupirocin ointment at the peritoneal catheter exit site was performed. 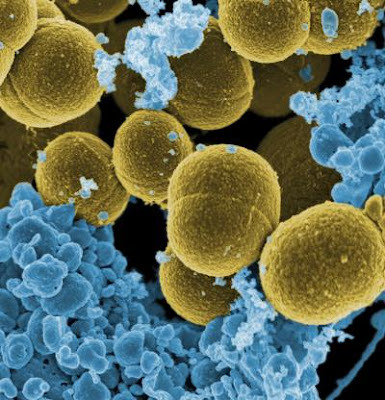 Patients in the gentamicin cream group had a comparable number of gram-positive infections compared to the mupirocin group and a lower rate of gram-negative infections. As a result, gentamicin cream, applied daily, is now recommended as the prophylaxis of choice for peritoneal dialysis patients. How much peritoneal dialysis is enough? 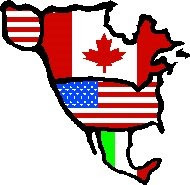 This question has been the basis of two major, landmark trials in the peritoneal dialysis community, the CANUSA study (named as such because it looked at PD patients in Canada and the U.S.A.) and the ADEMEX study (looking at PD patients in Mexico). The CANUSA study was a prospective cohort analysis; the original analysis suggested that higher total solute clearance--which is calculated by adding the PD solute clearance to residual renal solute clearance--is associated with an improved mortality, and based on this analysis a recommendation of maintaining a higher total KT/V (>2.0) was recommended. However, the results of the ADEMEX trial--the largest prospective, randomized controlled trial to-date in PD patients--showed paradoxically that increased PD solute clearance conferred no survival benefit, and rather that residual renal function was the primary predictor of survival. A subsequent re-analysis of the CANUSA data--which had made the now-recognized-as-incorrect-assumption that the residual renal function KT/V and peritoneal dialysis KT/V are simply additive--showed a similar result as the ADEMEX trial, namely that residual renal function is primarily responsible for any mortality benefit seen in the group of patients with a higher KT/V. Based on these results, the current KDOQI guidelines recommend a lower target KT/V of 1.7. There are numerous different types of radionuclide imaging which are used in renal imaging--more commonly in pediatric than in adult patients, and as such my knowledge of these procedures as it pertains to adult nephrology patients has always been a bit hazy. Fortunately there is an excellent review of this topic in this month's Nephsap from ASN featuring Renal Imaging. One of the tests often ordered in pediatric populations is that so-called "Mag-3 Renal Scan". This stands for technitium-99m-mercapto acetyl tri glycine-3, the radiotracer used in this form of imaging termed "dynamic renal scintigraphy." The radiotracer is injected intravenously and then dynamic images of the collecting system are obtained over a 30-minute period, over which time the tracer should be excreted and appear in the bladder. This technique is useful for demonstrating functional obstruction--for example, due to a kidney stone or other anatomic abnormality--based on the rate of Mag-3 washout from the collecting system, particularly in instances when other imaging modalities (e.g., ultrasound, CT urography) fail to demonstrate a definitive obstruction but there is still a high suspicion that one exists. In order for renal cysts to grow in patients with polycystic kidney disease, it turns out this requires the pumping of chloride ion into the cyst lumen. This is carried out by the CFTR channel, the same chloride channel which is mutated in patients with cystic fibrosis. Interestingly, there are some patients who were unlucky enough to inherit both CFTR and PKD1 mutations--giving them both cystic fibrosis as well as polycystic kidney disease. Although the data is limited, it appears that these individuals with dual mutations had reduced cyst growth (Xu et al, J. Nephrol, 2006). 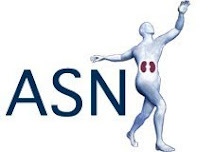 More recently, in this month's issue of JASN, a group (Yang et al, JASN 2008) published data looking at small molecule inhibitors of CFTR--and were able to reduce cystic growth in a mouse model of cystic kidney disease, suggesting that this may be yet another useful therapeutic target for ADPKD. A question which comes up not infrequently during nephrology fellowship is whether or not to perform pheresis on patients with multiple myeloma. Once very much in vogue, the results of a fairly recent (Annals of Internal Medicine, 2005) randomized control trial cast doubt on the efficacy of plasma exchange in this group of patients, and it is not used with as much enthusaism (though I have certainly seen it done). The trial was done on over 100 patients with newly-diagnosed myeloma and acute kidney injury who were randomly assigned to conventional therapy alone versus conventional therapy plus pheresis (5-7 treatments over 10 days). The end-point was a combination of death, dialysis-dependence, or GFR<30 at 6 months. The two groups did not show any significant difference though there was a slight “trend” (58% versus 69%) towards benefit in the pheresis group. Limitations of study were that there was no renal Bx performed and the numbers were small. I myself am not in favor of pheresis for patients with myeloma. 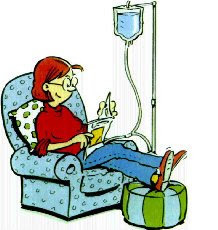 If I were to use it, I would do so only in conjunction with chemotherapy (the clearance of light chains by pheresis, which is actually pretty inefficient, provides a temporary effect only), and in patients with relatively high concentrations of serum & urine light chains. I would imagine that this treatment, like many in nephrology, would be much more effective early on in the course of renal involvement, and may have little effect on patients with advanced renal failure or those already on dialysis. Peritoneal dialysis solutions are often color-coded based on the dextrose concentration. Dextrose is used as the osmotically-active agent. As it is partially absorbed, patients with diabetes have to watch out for elevated blood sugars. In addition, diabetic patients with extremely elevated blood sugars (e.g., in DKA for instance) will have a decreased gradient for ultrafiltration so it is especially important to keep their blood glucose under control. Anyways, it's important to know the color codes since often the patients will know they take 2 green and 2 yellow bags but not know the dextrose concentrations. Not all peritoneal membranes are created equally. The peritoneal equilibration test (PET) is a standardized method for assessing peritoneal membrane function, and is used for tailoring an appropriate, individualized PD prescription. The test is based on the fact that different peritoneal membranes have different transport characteristics. For "high transporters", solute exchange occurs rapidly, but as a result the osmotic gradient provided by the PD solution dextrose dissipates rapidly and sometimes these patients run into problem with ultrafiltration. They are best managed with shorter, frequent exchanged and may be excellent candidates for a cycler. In contrast, "low transporters" exhibit inefficient solute exchange and may require prolonged dwell times. The majority of patients fortunately fall in the "intermediate transporter" range and can usually be managed with either CAPD or CCPD strategies, whichever is more convenient. The PET test involves beginning a PD dwell and then taking blood and dialysate samples at different time points. The D/P ratio (dialysate-to-plasma) of creatinine, BUN, and glucose is measured. Patients with a high D/P ratio (e.g., >0.8 at 4 hours) are considered high transporters whereas those with a low D/P ratio (e.g., <0.5 at 4 hours) are considered low transporters.